NextComputing has announced automated PCAP extraction workflow capability for its widely-used, real-time, open PCAP solution, Packet Continuum. Automated PCAP workflow capability presents a great benefit to the Wireshark community, as well as other open-source network forensics software tools such as the Security Onion suite. The Packet Continuum can scale for lossless capture at any line speed, from 1Gbps to 40Gbps, and can further scale to over 100Gbps. Packet Continuum’s real-time packet analytics provide the first level of information in the form of a real-time event log. User-defined Active Trigger events are dynamically adjustable. These real-time features ensure a user will never lose a packet, and route only the most important transactions into Wireshark. 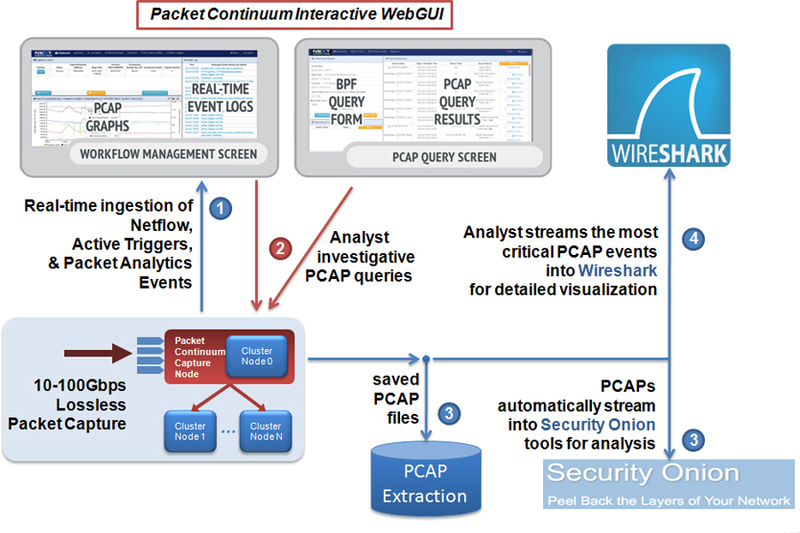 Packet Continuum’s automated PCAP workflows provide Wireshark users with an interactive investigative environment for retrospective packet analytics. For example, a user may discover a list of IP addresses with suspect activity, from which the user can make a BPF-based query for packet data and get immediate streamed results. 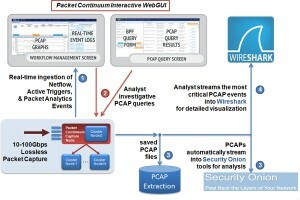 Even for a query with very large results that may take seconds or minutes to complete, Packet Continuum will begin streaming PCAP results almost instantly in 100MB “chunks” into Wireshark. At the same time, the same PCAP results stream to other open-source packages from the Security Onion suite, for log collection, data visualization and further investigative review. This new information will lead to more PCAP queries against the large capture store, as the investigative team narrows their focus to the target “bad guy” event.